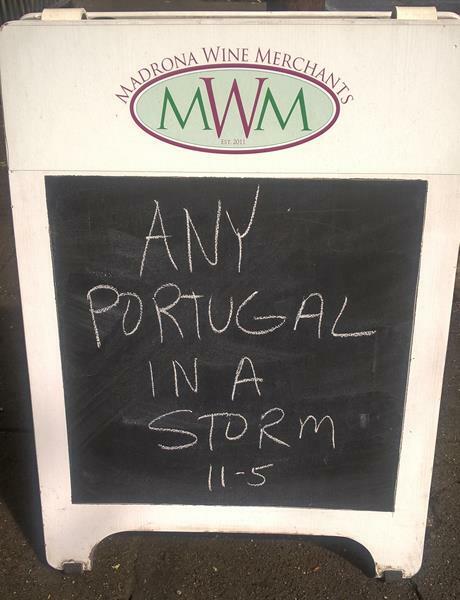 But seriously folks, we pouring two Portuguese wines whether the weather is pouring or not. Stop on in for a sip in the storm. While the wind blew in a bit of moisture to our August weekend, there is still a bit of Summer in the air in Madrona. It is still Summertime. And the living is still easy. And we’ll be pouring some Summery wines this weekend to suit the season. wines. We’ve picked wines from Piedmont, Veneto, Puglia and Tuscany designed to quench a Summer thirst. They are all fresh with plenty of fruit to match the richness of the season. Stroll on by and give them a try. Sunday we are featuring two wines from Portugal with indigenous grapes that are less familiar outside that country. An estate grown Vinho Verde with a citric and tropical fruits aromas and a long and appellative finish. A wood-aged wine, at a good price, the Casaleiro Reserve has fully structured tannins supported by delicious red fruit with a beam of acidity. The taste of the wine ends with spice, fruit and tannins in the background. Summertime and the living is easy. In wine we look for ones that are fresh and giving with plenty of fruit to match the richness of the season. This Saturday we’re pouring five such wines from the corners of Italy. We’ve picked wines from Piedmont, Veneto, Puglia and Tuscany designed to quench a Summer thirst. Stop by and taste for yourself. Arneis has been cultivated since antiquity in the hilly and sandy soils of the Roero. Here Povero makes this D.O.C.G. white. This crisp wine has an intense and fresh bouquet, and dry flavors of fresh hay, pippin apple, almond and pineapple. This small family estate in the Veneto region makes this fresh Valpolicella to drink while they wait for their Amarone to age. The wine is intense and quite complex giving off a fine aroma with a heady, fruity and floral overtones. 2013 Giá, Langhe Rosso $15 — 1ltr. The Giá is made by Fontanafredda whose top notch Barolos take decades to fully develop. But with this Langhe Rosso there is no need to wait. The wine has intense red fruit and violet aromas that make your mouth water for the first sip which is pleasantly dry, smooth and perfectly balanced. This young wine shines with ripened plums and cherries. The palate is fruity, and smooth with a focus on dark red fruits accompanied by subtle notes of licorice, earthiness, and spice. An oaked Primativo from Pulgia, the Quota is dark and smooth and rich with flavors of blackberry, Kirsch, cassis, chocolate, a hint of tar, a little leather, caramel, stewed raspberry, and baked figs. The bouquet is ripe with Morello cherries, mint and blackberries. The wine is pleasant on the palate with fresh and expressive characteristics. 50% Cabernet Sauvignon, 30% Syrah, 20% Merlot. The Poggio ai Ginepri comes from Bolgheri, a region in Tuscany where traditionally French varietals thrive. Indeed, this Super Tuscan has left the Sangiovese out altogether. The wine has a good structure and a high concentration. Its broad and deep olfactory landscape opens in a very frank and immediate manner with fresh aromas of mature red fruit, citrus fruits and hints of spices. The palate is round with complex ripe tannins and a herbal and mineral finish with hints of licorice and a pleasant fruity aftertaste. Near and Far – This Sunday we’ll be pouring two Sangiovese meant for everyday enjoyment. One is from the Old World. One is closer to home. Come see which world you prefer. The L & F is a good everyday Sangi from Puglia with spicy aromas, plum and dark cherry flavors and a touch of old world earth. A juicy Washington Sangiovese jumps in at a great price due to it being Washington Wine Month once again. It is a nice friendly little sipper. Special price for the month of August. It looks to be a fine weather here in Madrona as the sun burns its way through the morning haze that makes one think of wildfires and be thankful that we live on this side of the mountains. This weekend at Madrona Wine we are getting back to basics with two days of tastings. French is the new black, and Saturday we’re pouring some sleek, elegant and stylish wines from France that offer a solid foundation for any meal. You don’t want to miss the L’Opaline, Provence Rosé and the 2010 Xavier Gigondas is on a class by itself. Sunday we’ll be pouring two Sangiovese meant for everyday enjoyment. One is from the Old World. One is closer to home. Come see which world you prefer. A juicy Washington Sangiovese jumps in a great price due to it being Washington Wine Month once again. It is a nice friendly little sipper. Special price for the month of August. Swing on by and join us. Sometimes you just have to go back to basics. This Saturday we’ll be pouring a solid line up of basic French wines that offer a solid foundation for any meal. Château Le Grand Moulin is located in Saint Aubin de Blaye in Bordeaux. The wine has aromas of ripe, almost candied fruits, harmoniously combined with roasted and wooden notes. It is a soft mellow Bordeaux with elegant and melted tannins. Swing by on Sunday to have a swig of two distinctly unique wines from disparate parts of the world. We’ll be pouring an electrically crisp Sauvignon Blanc from Slovenia and rich and complex plum wine from Japan. They are more of a contrast than a comparison, but both are not to be missed. A drier version of plum wine with more complexity, the wine is made all from handpicked plums and is aged 3 years before bottling. It has notes of raisin, pecans, nutmeg, candied oranges and a tart finish. It is unique and tasty and only 13% alcohol. Summer is great for vacations. So this Saturday we are hopping all over Europe and tasting crisp and refreshing wines from Germany, France, Austria and Spain. These wines are all unique and delightful and an escape from the everyday. Come slip away with us and give them a try. The Heyden family runs a small 11 hectares estate in the town of Oppenheim. Silvaner is the second most planted grape (after Riesling) in Germany, and this old vine example is a fresh, zesty, mouth-wateringly delicious wash of Silvaner-ish-ness. Juicy and floral from start to finish, this is a great example of coaxing the best from a grape. Novellum is a custom cuvee of Chardonnay grown and made by Jean Marc and Eliane Lafage for Eric Solomon. The Latin name “Novellum” echoes “Nouveau” (“new. To achieve its balance of fresh acidity, ripe fruit and a touch of minerality, 70% of the wine is aged in stainless steel, and 30% is aged briefly for 2 months in one-year old barrels. But the real uniqueness in this wine comes from its aging method: it is aged on the “lees” of previously fermented Viognier for three months, imparting a luscious floral character that’s different from the average Chardonnay. Pratsch is a organically certified winery in the appellation of Niederösterreich, Austria. Their unusual and delightful rosé features aromas and flavors of wild strawberries, peach and pear backed by crisp, dry, refreshing acidity. Made from Grenache, the Coralí follows the purest tradition of Mediterranean rosés: pale, with the soul of a delicate white and the body of a fruity red, fresh and mouth-coating, tangy and ripe at the same time. The aromas are a blend of ripe peach and herbal notes, with a citrusy character. Made from 80+ year vines the Gassier Cercius is a lush, decadent offering that delivers loads of black raspberry and blackberry styled fruit that is intermixed with notions of licorice, rolled stone, roasted garrigue, and hints of leather on the nose, layered, fresh, and beautifully textured, with a full-bodied, rich feel in the mouth that never seems heavy. Ripe dark berries and wood smoke on the perfumed nose. Lush and creamy in texture, offering sweet blackberry and cherry flavors lifted by a spicy element. It finishes sappy and broad, with gentle tannins and subtle anise and cola qualities. Rosé & Barbera, Bottle or Box? This Sunday we have two wines in bottle or box. The Campuget Rosé is from French Syrah and Grenache grapes. The Italian Barbera is more straight forward. Come check out these oddballs. 100% Barbera from estate vineyards in Monferatto, traditionally vinifed in large-format Slavonian oak. Bright red cherries, soft tannins, and mouthwatering acidity make this a perfect everyday red, clean and focused with great balance. We look all over to find delicious wines. This Saturday’s tasting is a prime example. We’ll be tasting wines from Italy, France, Spain and Columbia Valley. They come in different colors and styles but somehow together they all fit. Come find the common denominator. From a 100-year-old winery in Lazio comes this uncommon blend of international and local varieties that really works. Fruity, lightly aromatic with mineral aromas which are confirmed on the palate along with a pleasing crispness and a lengthy finish. This 100 year old winery in Valencia Spain kicks out some good juice for a very low price. The wine has aromas of wild fruits with spicy notes and a vanilla background from its time in oak. The palate it is full-bodied with long persistent notes of forest fruits that are accompanied by sweet tannin ripeness that is well integrated into the structure of the wine with a long and pleasing finish. Matteo Correggia’s one hundred percent Nebbiolo Roero DOC comes from a single vineyard in Canale d’Alba. The Nebbiolo is aged for 12 months in neutral barrique and then eight months in steel vats. It is very pure, clean, expressive and loaded with varietal cherry fruit, spice and fine tannins. Reminiscent of the bold Abbot’s Table blends of past vintages, this 2013 bottling is rich and structured. Sweet aromas of baked blueberries, pomegranate, violets, pencil shaving, clove, pepper and Grand Marnier. These sweet aromas give way to a more serious palate brimming with blueberry, white pepper and black tea with lasting tannins.